Before you buy any other polyhedral dice for DND, D&D, MTG, RPG or any other games, bulk or otherwise, consider this assorted polyhedral dice set of 126 die with 18 sets of colors and 7 different sizes, complete with polyhedral dice bag! The velvet pouch is easy to open and fits almost anywhere, but the best part is that the die inside are probably your newly customized favorite set. Speaking of luck, you may just find that you don't need it anymore because you can make your own! Each color set has 7 size/shape varieties: 4-sided, 6-sided, 8-sided, 10-sided, 12-sided, 20-sided, and one "%" die. For measurements, see below! On top of Dungeons and Dragons, RPG, and any of your favorite table games, these dice are versatile, making them excellent gifts for dice collections, great teaching aids or educational props, and perfect for parties! Our attention to detail means that we make sure to only send the newest, never scratched, broken, or otherwise blemished dice straight from our workshop to you! In mint condition! Everything You Need To Roll The Dice: With a polyhedral dice set of 126 in 18 different colors, you can customize your favorite set for Dungeons and Dragons, more. Comes In 7 Varieties: Includes 4-sided die, 2 x 2 centimeters; 6-sided die, 1.6 x 1.6 centimeters; 8-sided die, 2.4 x 1.8 centimeters; 10-sided die, 2.2 x 2.1 centimeters; 12-sided die, 2 x 1.8 centimeters; 20-sided die, 2.3 x 2 centimeters; and % die, 2.2 x 2.1 centimeters. Easily Take Your Game Anywhere: With a velvet pouch that's easy to open and fits almost anywhere, its compact size 7 x 6 inches (18 x 15 centimeters) is dice-perfect. Factory First Dice: This polyhedral dice and pouch are brand new, free of chips, holes, and cracks, and everything you could want in DND, D&D, MTG, and RPG dice. Best dice ever! Thanks! Great price! Beautiful colors. The translucent ones look like candy, but don't eat them! They are plastic. I spent less than 40 bucks for more polyhedral dice than I will ever use (Yes, including shipping, and tax). 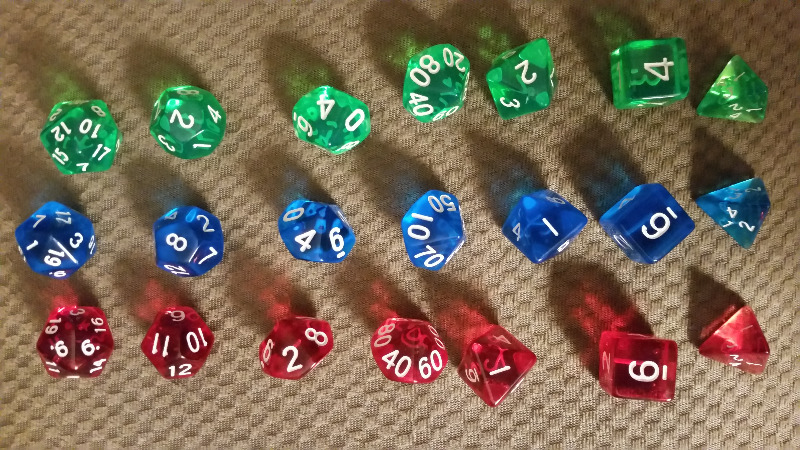 If you are running a D&D campaign, or any campaign that requires dice; this is the set to get. These aren't ****** dice, they are just as good/identical to the 7 piece set I got at my local gaming store for $10.50. Do the math: 4 sets of dice from the gaming store for 42 bucks, or 18 sets of dice for a few dollars less. Imagine you have two high level fighters doing 3-5 attacks each, are you going to have these poor fools fight over who gets to spend the next 20 minutes rolling for attacks with a single die? Screw that, get this kit and there is no party too big for your next campaign.